How is the process of data collection, evaluation, selection, and prioritization of projects, as well as the monitoring of the entire portfolio arranged? When speaking of portfolio management, the question about the detailed practice is posed, e.g., process design and quality. The participants rate their processes fairly homogeneously as standardized, transparent, and documented; but not very efficient and automated. This coincides with the results of the following chapter Systems. The companies seem to be set up more traditionally, that is to say existing processes are often regarded to be less efficient due to lack of technical support. This is not surprising, as these processes are very data and change intensive. The participants were asked to rate their perception of their maturity levels in these process characteristics (0 = very low / 5 = very high). Aggregated across all characteristics, the best performers evaluate themselves on average with 3.82, the low performers with just 2,30. The processes are regarded by all participants as inefficient and barely automated. The question about the scope of the application correlates strongest with total maturity. 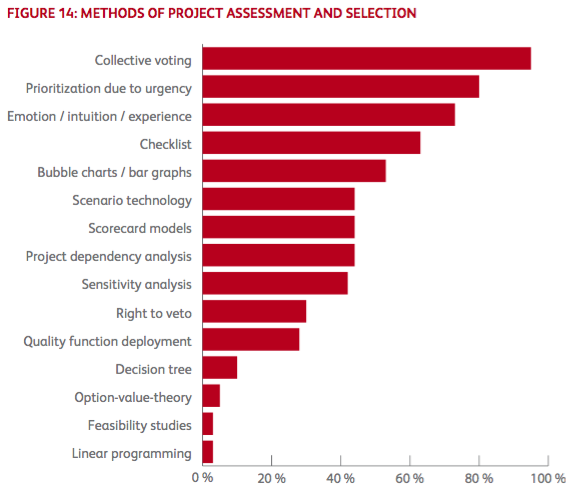 The more widespread the use of project portfolio processes, the higher the participant ranks in terms of maturity. Led by budget and resource planning, as well as continuous monitoring and multi-project orientation, controlling functions dominate the applications of the method. Here, we observe finance-driven behavior to which other aspects are significantly subordinated. The topics of operative project controlling, risk management, and project data management are mentioned considerably less. However, as previously mentioned, the participants who also mention these topics are significantly more advanced in terms of maturity than participants who limit themselves to the most common topics. Without wanting to jump to interdisciplinary conclusions, it can be observed that the specified areas, e.g., centralized project data management, require high levels of IT support. In the following chapter, Systems, it becomes apparent that claims, self-awareness and objective reality diverge rather strongly. Stating resource management as the main function of portfolio management appears to be equally inconsistent, as the contrary to this statement is the apparent segregation of resource management (Chapter B5). Portfolio planning processes run in fixed rhythms, determined by a planning practice that is tied to the calendar year. Sub-annual and multi-annual processes supplement this procedure. It is interesting that the planning horizons correspond with project life spans. 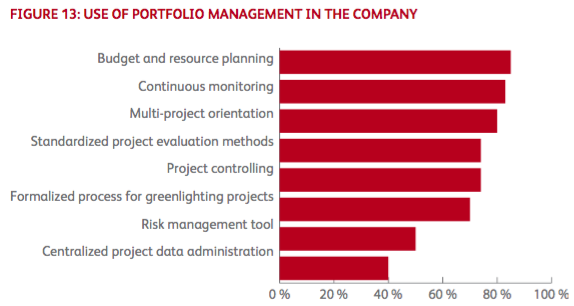 More than 70 percent fall into the categories from half-yearly to multi-annual, which coincides with the encountered project life span structures. The companies clearly prefer all methods and procedures that are more communicative and less analytical. Voting processes and prioritization due to urgency and emotion / intuition dominate, with a large margin to all methodological approaches. This block is subsequently dominated by methods that promise a high degree of visualization, such as the scenario technique or graphical evaluation of any kind. Statistic procedures and mathematical methods are very rarely named, e.g., in less than 5 percent of the cases; belonging to this is the option-value-theory, highly recommended by Cooper. Here is a large and obvious discrepancy between theory and practice, as well as between best and low performers. 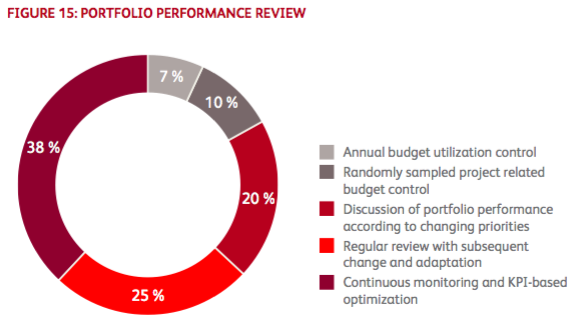 How does a portfolio’s performance review take place within the companies? There is a concise answer to this question. More than half of the participants state that they review their portfolios regularly or continuously according to key performance indicators, with just under 40 percent of the participants reviewing their portfolio yearly, via random sampling or with changing criteria. There are two critical remarks to be made at this point: on the one hand, there is the claim of continuous analysis with KPIs, on the other hand, very few KPIs, and practically no analytical methods at all, are actually mentioned. Additionally, only little or badly serviced, non-integrated IT systems, which could deliver comprehensive data, are at hand. The participants also claim, as previously mentioned, to predominantly use communicative methods, such as voting or even emotion, as a tool for project selection and prioritization.